An Oregon priest inspired the early Apple fonts #VintageComputing #RetroCOmputing #Apple @Apple « Adafruit Industries – Makers, hackers, artists, designers and engineers! Via KGW8 – Steve Jobs was enrolled at Reed in 1972 for a semester before dropping out. He remained in Portland and audited Professor Robert Palladino’s calligraphy classes. What were the early Mac fonts? When the Macintosh first shipped, it had a number of bitmapped fonts. Back in 1990, there were a number of standard fonts that are still familiar today, such as Chicago, Geneva, Helvetica, Palatino, and Times. These shipped with System 6 and earlier versions of the Mac OS. But early Macs also had a bunch of funky fonts that gave the Mac loads of character. There were dingbat fonts (picture fonts) like Cairo and Mobile. The San Francisco font, which looked like a ransom note, lent itself to playful documents. The Venice font was a favorite of many, since it was an easy to read script-like font. In 1991, System 7 introduced TrueType fonts that were scalable to any size. Apple did not make TrueType versions of all of the funky fonts, but they did make versions of the more businesslike fonts, such as Helvetica and Palatino. After a few years of transition, nearly everyone uses only outline fonts like TrueType or PostScript. In System 7.5, Apple introduced its last bitmapped fonts – Espy Sans and Espy Serif. These fonts were designed to look good on screens. 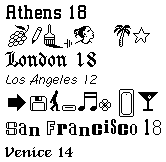 Apple made these fonts for its Newton PDA and used them for its fated online service called eWorld. Around that time there were screenshots of the next generation Mac Operating System; it used Espy Sans Bold for it’s system font instead of Chicago. With Mac OS 8, Apple introduced an alternative system font named Charcoal. It was a TrueType font that looked a little bit like a cross between Chicago and Espy Sans Bold – people were expecting Espy as the new System font. Hidden inside the Appearance Manager that provided Charcoal, was the hint of future system fonts that finally showed up in System 8.5 like Gadget, Capitals, Sand, and Techno. The Gadget font was my personal favorite, and a survey I suggested on ResExcellence showed that it was the favorite of readers of that site. These fonts reintroduced some of the character that the Mac used to have back in System 6. Note: Espy Sans was last used as the system font on the iPod mini in 2005. You can read this article from Jonathan Ploudre for more on Espy and Mac fonts. Mac font fan? Let us know in the comments below.